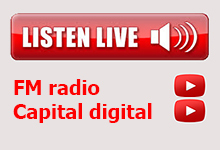 Capital Breakfast - It’s Capital Breakfast, bright music and information from early in the morning until 9. Swinging down the Lane - Everybody's feeling grand when they're “swinging down the lane”. Afternoon Gold - Afternoons on Capital Community Radio are pure gold when you listen in to the universal favourites. The music that's evergreen. The "golden oldies". 'Cruisin' - The hours “rock on” when you’re Cruisin' on Capital Radio. The chart toppers . . . rock n' roll . . . the hit parade years. Music and news for past and present members of the Armed Forces. Great music fromthose days when we were young. Top country music, the best of the popular performers. Two hours of relaxing music to listen to. A mixture of music to relax with at the end of a busy day. Relaxing music from those great days of yesteryear. The lighter side of classics! Beethoven, Mozart, Tchaikovsky, Bach and all of the other great composers. Friday Night Dining and Dancing - End of a busy week so something to dine and dance to. Capital Events - Saturday mornings are special on Capital Radio as we celebrate the arts and meet the people who are making the news in Perth this week. Saturday Afternoon Swing Shift - It's noon on Saturday and if Swing is your thing, then it's time to swing on Capital Radio. Don't miss it! Swing Shift! Three hours of great music and all of the top singers. Afternoon Gold - Music for you to totally relax with on a Saturday afternoon. Easy Saturday - Saturdays for many people are days of relaxation. Music that’s just right for such days is the Easy Saturday programme. Music specially chosen that’s easy on the ears. Saturday Night Party - If you’ve still got the energy and you’re in the mood for partying, then see the night out with some lively party music! Sunday Breakfast - Bright music and information to start your Sunday off right. Sunday Brunch - Those special relaxing Sunday morning hours when you can have brunch with us and and listen to the sweetest sounds around. Easy Sunday Afternoon - Cool or hot. Whatever you like in jazz, you’ll hear it in Easy Sunday Afternoon Jazz and Swing on Capital 101.7fm. Jazz comes alive in this show. Eclectic Sunday - It’s a mix of music styles from a variety of sources. The best radio entertainment around on a Sunday afternoon. Easy Listening - When we play those favourites of yesteryear that bring back fond memories. Very easy listening! After Hours - Relaxing music to wind down the day.